Each year workers are injured and even killed while working on Ontario’s roads and highways. Pro-Tech Training Services provides Book 7 and Traffic Control Person training that can help reduce or even eliminate this tragic loss. Pro-Tech Training Services’ instructors have spent many years experience installing traffic control devices or teaching staff how to apply the industry best practices found in the Book 7 Ontario Traffic Manual for Temporary Conditions and the Occupational Health & Safety Act and Regulation 213/91. Pro-Tech will ensure that each candidate is versed in the relevant content that applies to their position in the organization and how to create a Traffic Protection plan. 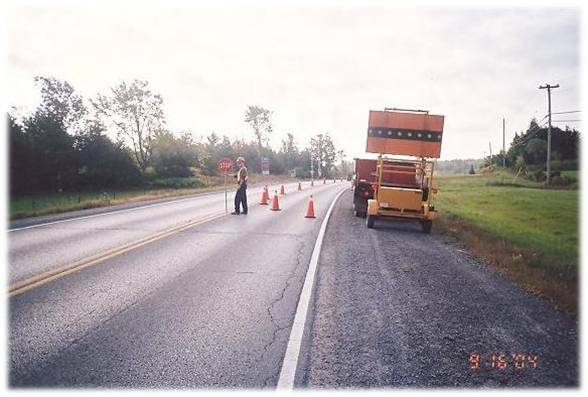 If your staff are required to work on or near roads or highways in Ontario, Pro-Tech can provide training and knowledge that they can use to be safe on the job. Pro-Tech Training Services is pleased to provide training across Eastern Ontario at your location or at our training facility in Napanee. Call Pro-Tech Training Services at 613 354-7007 to register your staff.